In the recent past we undertook a very complex and multi-dimensional landscaping project in River Oaks that involved the replacement of an old outdoor kitchen with a new landscape arbor. This new structure was very technically and aesthetically unique in several different ways. To start with, it was not made of cedar as are many landscaping arbors. Rather, it was constructed entirely of pressure-treated, rough cut pine that was stained to look like cedar. The advantage of using pine lay in the both the lower cost and in the longevity of the wood—up to thirty years. The landscape arbor was built for comfort. We installed fans and lights so that it could be enjoyed by the occupants at any time of day or night. This created a challenge from an aesthetic perspective, however. When installing anything electronic in a landscaping arbor, most contractors have to run conduits up the sides of the beams. This detracts from the appearance of the structure, and was something that we wanted to avoid in our project. There was no easy way to work around this, however, simply because the wires themselves had to be run through interiors of the beams in the arbor. Because they could not be wired in this fashion after the fact, what we had to ultimately do was erect the beams and joints, notch each one individually, and then take them down to run the wires through. Not only did this enable us to conceal the wires, but it also added considerable strength and stability to the arbor itself. After the landscape arbor was reassembled, the routed areas were then covered with wood and the wires were completely hidden from view. Lighting controls were installed in the interior bottom portions of the beams, where they would not be seen by anyone but the person operating them. The importance of taking these extra steps in the arbor’s construction cannot be overemphasized. While it was considerably more labor intensive—and thus more expensive—it was an investment that the homeowners insisted on making. The elegance of the wireless design contributes to the visual effect of the arbor rising from the landscape’s background vegetation like a natural form in its own right. The beams were also slightly arched to compliment the arc of the pool, and the entire arbor was backed by a yew hedge that provided a silhouetted of green just behind the structure. Finally, to fully complete the unity of the arbor with the surrounding landscape in both actuality as well as appearance we also made OGEE custom cuts in the beams to allow for a pathway for vines to grow up the sides. In the years to come, the vines will intertwine with the arbor beams, completing the sense that the arbor is a part of the green landscape that sprung from the ground as if the earth itself had somehow conceived of a perfect outdoor structure for man. At night, the arbor dominates the landscape without overpowering it. A ceiling fan in the top of the structure keeps the interior cool even on the hottest Texas summer nights. Down lights on either end spot light urns on either side of the arbor, linking it visually to the pool in front. In the back, mercury vapor up lights illuminate the Japanese yew, blending the colors of wood and greenery together in the ambient mystique of emulated moonlight. 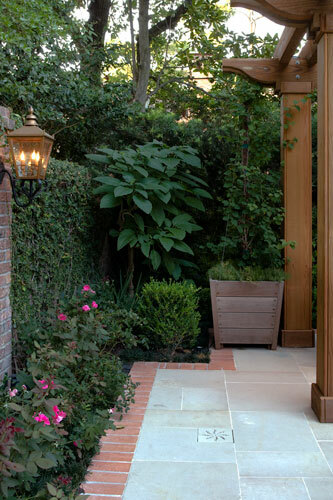 If you are interested in any high-quality landscape services, Exterior Worlds has been providing the high-end residential landscape services and garden design services discussed above for the Houston and the surrounding areas including memorial villages (Piney Point Village, Bunker Hill Village, Hunter Creek Village), Tanglewood, River Oaks, West University and the greater Houston (Hou), area since 1987.